No matter how many times it happens, a full moon always seems to invoke a certain amount of awe after it emerges from the horizon. This past Saturday I was out camping for paintball in Pennsylvania when I first spotted the orange full moon. Although I was in a magnificent location to capture the moon in all it’s glory, I did not have my Nikon with me. It was hard not being able to photograph the rare event but in a way I was glad. Not having my camera forced me to sit back and just appreciate the moon in the raw, not through a lens, not on the back of a LCD screen, but through my own two eyes. As I gazed upon what seemed like a giant orange in the sky, I couldn’t help but think how I would compose a picture feature the moon once back home. I spent the rest of the evening kicking back with friends reminiscing about our glory days in college, knowing that tomorrow I’d have my shot at the moon. After getting home from my trip to PA, I quickly gathered my gear and set out for the waterfront to get in position to shoot for the moon. It was cloudy on Sunday but I remained optimistic that the moon would find a way to peek through the clouds. After arriving at Pier A, I scouted a few spots for my picture then patiently waited for the moon to rise from the Western horizon. The predicted moonrise time came and went, and there was still no sign of the moon. After about 15 minutes doubt started to creep into my mind and I began to think that perhaps the clouds were just too thick to see the moon. Once 20 minutes hit I started to head back uptown feeling very defeated. As I walked past Pier C I took a quick glance at the horizon and much to my surprise I saw an orange glow starting to burst through the clouds. Could it be?! Yes it was, it was the orange mood that I was eagerly waiting for. I quickly ran back to my spot at Pier A, composed my picture and the rest is history. When it comes to composing a picture featuring a full moon, or even the sun, one of the keys is knowing where your subject (the moon/sun) will be and when. Although the moon popped out later than I originally expected, I still had a good idea about when it would rise and where I should look for it. I’m sure there are plenty of options out there for figuring out the moon’s location but my information source is typically an iPhone application called “The Photographer’s Ephemeris.” I’ve mentioned this application in the past, but it’s so valuable that it’s worth a second shout out. Below is an example of how I planned the composition of my picture based on where the moon would be. The reason I chose this location was because the trees lining Pier A created a natural leading lines composition, drawing your eyes down the pier towards the moon. I knew my focal length would leave the moon looking tiny, so I had to give the moon a boost a good composition to make it stand out. Other than the trees, I also used the light reflections in the water to naturally point towards the moon. In order for me to get the water looking as smooth as it did, I had to shoot a long exposure. The trade off of shooting a long exposure was the moon wasn’t as in focus as I would have liked. In hindsight I wish that I shot a few pictures using a quicker shutter to capture more detail in the moon. The next full moon like this is on August 10th which leaves me plenty of time to plan out my next shot. Mark it on your calendar, pick a location and shoot for the moon! Hoboken is a great place to live if you enjoy running. Hoboken has countless running routes to choose from, most of which are accompanied by an amazing view. Since moving to Hoboken over a year ago I’ve mapped out a few of my own running routes. Each route presents a different physical challenge along with the constant mental challenge of fighting the urge to stop and take pictures every few steps. Out of all the routes I run, my favorite is what I refer to as my “uptown route.” My uptown route starts at Maxwell Park and hugs the water line all the way into Weehawken. Eventually I circle back to Hoboken the same way I came, with my finish line being the path featured in this picture. The reason this route is my favorite is because typically there aren’t many other joggers to get in my way and of course having this view as my finish line is a nice perk. I run a few times per week so I’ve seen this view countless times and countless times I’ve said to myself that would make for a great picture. Not only is this a beautiful site, it also reminds me to always finish what I start. Each time I get to this point of my run I’m usually tired and ready to stop, but instead of slowing down I usually kick up the intensity for this last straight away. Typically I wait until some other runner makes it about halfway then I chase them down and try to finish ahead of them. I believe that the more you train yourself to push through hard situations, the more it becomes second nature and the stronger you’ll be both physically and mentally. This is the code that I live by and this picture reminds me to practice this each and every day. Always finish and always finish strong! One of the reasons this view always draws me in is because of the natural “Leading Lines” composition. 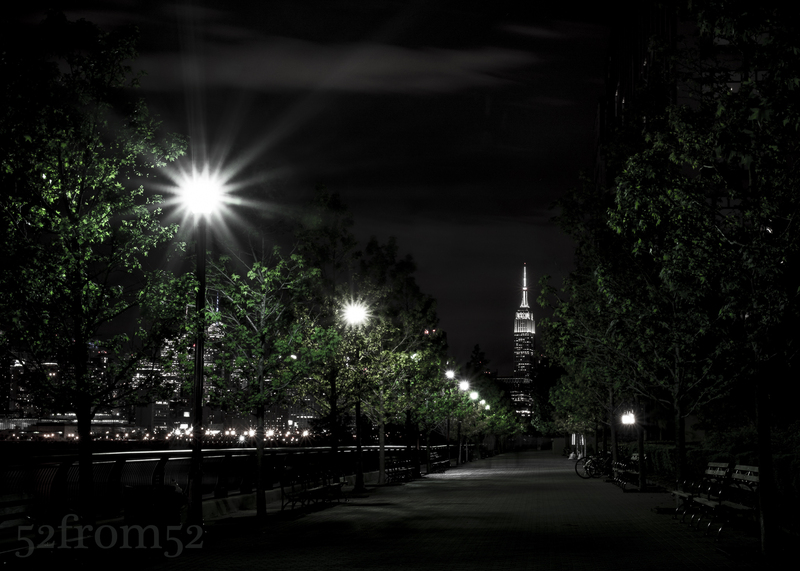 The lights and trees that line the path converge and take your eyes straight towards the Empire State Building. Year round this is a powerful view but the conditions never seemed right for me to get a good picture. Additionally the street lights always presented glare issues that took away from the picture. Recently I figured out the right camera settings and editing techniques to eliminate the glare issues so I finally decided to give this picture a shot. The camera setting that has helped the most with photographing strong light sources (e.g. the sun, street lights, ect.) has been a small aperture. The smaller the aperture the less bleeding light and the cleaner it looks. 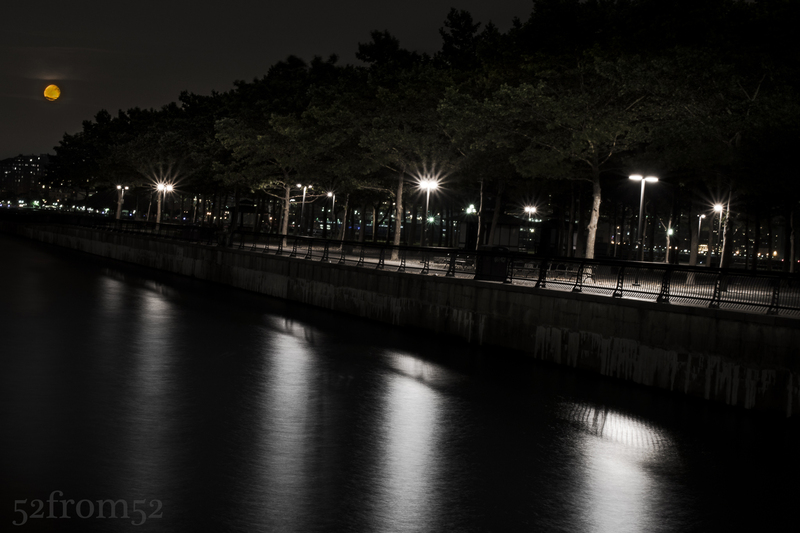 For night photography f/18 and above is a great aperture to use. If you’re using this small of an aperture at night it’s more than likely that you’ll be hitting some slow shutter speeds so don’t forget your tripod. When it came time to edit this picture there were two adjustments that were key. First, to bring out the detail in the Empire State Building I dropped the highlights of the area surrounding the building. I’ve found that dropping the highlights of buildings at night makes them look very crisp. The second adjustment was to lower the saturation all colors in the image except green. What this did was eliminate any of the lens glare that showed up as random colors, and it made the leading lines composition of the trees even more of a focal point. As a result the not only does the composition of the image take you down the path but the isolation of the green color also acts as a guide for your eyes too. 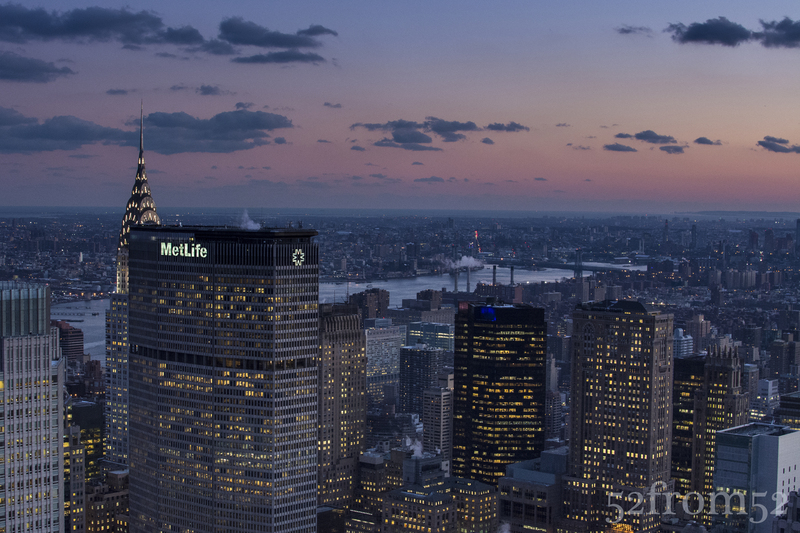 The last aspect of this picture that helped enhance the composition was the size of the Empire State Building. If you’re a Hoboken local and you’ve taken this picture before chances are the Empire State Building was much smaller than in this picture. Why is that? It’s because of my focal length 36mm x 1.5 = 54mm. Most phones shoot at around 30mm and since focal length essentially equates to zoom so when I use ~54mm the building is larger. The thing that’s interesting about zoom is if you stand further back your foreground will be scaled regular, but whatever is in the background (e.g. the Empire State Building) will appear larger than usual. You see this technique a lot when people photograph the moon and get that insanely large moon backdrop. Although I shot with a greater zoom then people do with phones, my image resembles how this path looks like to the naked eye. 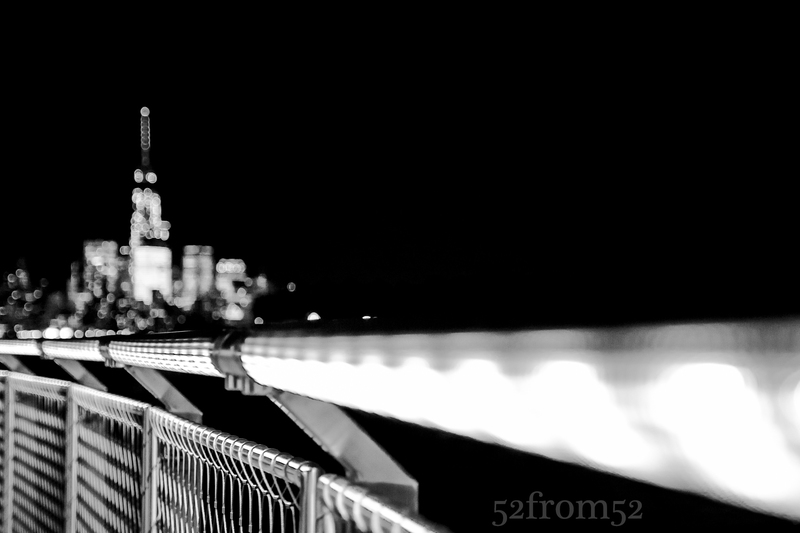 Had I stood further back and zoomed in with 80mm+ the Empire State Building would have looked massive. I’m limited to the 35mm range for this blog but I encourage you to try zoomed focal lengths to scale up your backdrop subjects. Experiment with your camera’s settings and new focal lengths, it’s the only way you’ll learn! What do I want to accomplish? This is a question that often keeps me awake at night. I’m all about setting goals and doing whatever it takes to complete them. Step one of having a goal oriented mindset is obvious, set some kind of goal. If you don’t know what you want to accomplish, how can you achieve it? This “goal oriented process” is the concept I applied after purchasing my camera, my goal was to learn photography. After setting my goal, step two was figuring out a way to achieve my goal, which led me to create this photoblog. With the end of this photoblog quickly approaching, I’ve been spending time thinking about what will be my next step in achieving my overall goal of learning photography. Learning photography is hard to measure though, one can argue that you can never fully learn photography. There will always be some new camera, some new technique or just something new to learn. Knowing that I’ll never be able to measure my original goal has made me think, perhaps it’s time I expand my goal and decide what I’d like to do with my newly found photography knowledge? I’m now asking myself, what do I want to use my photography to accomplish? Is my passion for photography just a hobby, or do I want to take it further? This past weekend I set aside some time to think about the questions I’ve raised about my next steps. While kicking around ideas I decided to throw on a YouTube video from one of my favorite photography resources, “CamerRec Toby.” Toby is a photography pro out in Vermont with his own YouTube channel devoted to reviews and tips about photography gear and techniques . I’ve cited Toby’s videos before but this week one of his videos really caught my attention. In the video (link below) Toby and his co-host Christina discussed an article “7 Reasons why most Photographers and Videographers don’t Reach their Goals” (link below). The article was so relevant to what I was currently thinking about it almost seemed like it was targeted directly at me. In the article the author talks about photographers setting too general of goals (e.g. Learning photography), and how it’s important to have measurable goals. The article helped put things in perspective and made me realize it’s time for me to set some measurable goals. The article and Toby’s video also motivated me to push forward on one of the smaller goals that I’ve been toying with. As of this past weekend, I’ve decided that I’m going to participate in the next Hoboken Art & Music festival in September. My main goal isn’t to make money (though that’s always a bonus), my main goal is to meet lots of people and seeing who and what might help me decide where to take my photography next. With a new goal (participate in the Art & Music Festival) set, step two was to figure out a way to accomplish it. There are many things that will go into preparing for the festival, but one of the most basic things is having plenty of pictures. As a result, this weekend I also decided to start a new project called “Hoboken Streets.” Since the festival is held in Hoboken, it seems logical to think many of the attendees will be Hoboken residents. Having a geographically targeted audience means I should have geographically targeted pictures, hence my “Hoboken Street” idea. 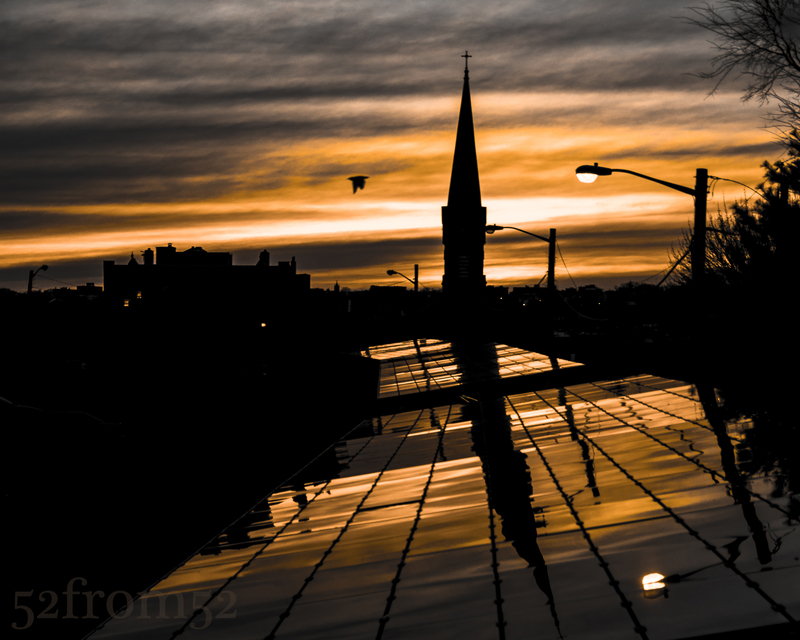 If you’re still with me, you’re probably asking, “how in the world does all this related to this week’s picture?” Well, even before officially deciding on the idea of doing a “Hoboken Streets” project, I wanted to explore more of Hoboken. Over the past few weeks I’ve changed up my nightly running route and began zig zagging around town looking for pictures. This past week one of my runs led me up 8th street towards Stevens around sunset, where I found this location. It might come as a surprise but I don’t run with my camera, so a few days later I circled back with my Nikon and got the shot. I wrote a little too much in the previous section, and the article I referenced could somewhat fall into this section so this week I’ll keep this section short. Two keys to this picture were composition and editing. In terms of composition, I wanted to have an equal balance between the sky/silhouette and the solar panels which were reflecting the sky/silhouettes. Instead of following the usual rule of thirds guidelines I split my image in two halves horizontally (top/bottom). The bottom half was focused on the reflection which was meant to lead your eyes down the path to the top half, which was meant to feature the sky and silhouettes. Editing was key for this image because I wanted to emphasize the contrast between the dark silhouettes and light from the sunset. In order to do create a nice contrast, I dropped the overall vibrancy of the image while boosting the saturation of specific colors. After my color adjustments, I was left with the contrasting image that I was looking for. Of course there were some other adjustments (e.g spot adjustments, highlights, clarity, ect.) but nothing more than I’ve talked about in previous weeks. If you haven’t already, circle back and read some of my earlier weeks posts to get some more in depth tips on editing and composition. There is a first for everything, and this week was a feast of firsts. For starters, this week was the first time that I didn’t post within my weekly deadline. After a busy weekend when it came time to write my post on Sunday night, I couldn’t resist collapsing face down on my plush tempurpedic. Other than my latent post, this week also marked the first time that my post’s picture was shot with something other than my Nikon 35mm f/1.8 lens. I still shot my picture at ~35mm but this time it was with a new Sigma 17-50mm f/2.8. I had been tussling with whether or not to buy a new lens for a couple of weeks. Last week I was finally able to validate purchasing a new lens. One of my stocks recently started to take a hit so I decided to cut bait and divert those funds to the investment of a new lens. Hopefully the lens will pay better dividends. The last two “firsts” worth noting are locations based. This week was the first time that I visited Washington Square park and the nearby Stumptown coffee shop. I’ve been to the Stumptown on 29th street a few times but never the second and smaller location by Washington Square park. It was nice finally checking out the park even if it wasn’t the best time of the day for pictures. The sun was at about 45 degrees and blindingly bright. After walking around the park for a few minutes with my friend that tagged along we decidle split off from one another so we could each focus on finding the best shot. As I moved away from the park’s iconic arch I found a couple ways to use to the sun’s harsh angle. One was to shoot some reflection pictures using the wet ground. 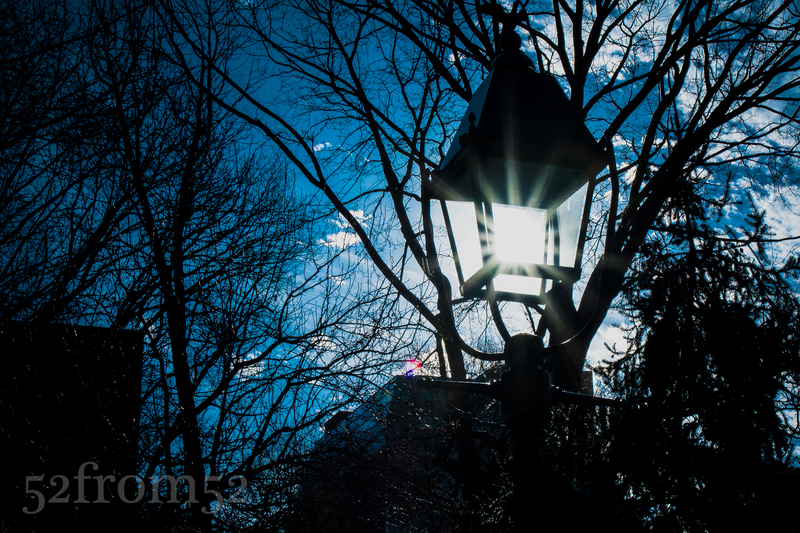 The second idea I had was to line the sun up within the street lights that littered the park so it looked like they were glowing in the daylight. Although both were fun ideas, they quickly grew old so I decided to find my friend and search for a better location. With sunset approaching we decided to head to Wagner Park located at the southern tip of Manhattan. I shot at that location once before during week 16 but since it provides great sunsets, I knew there was no harm in taking a return visit. While on our way south we seemingly stopped every couple of feet to take pictures. Since the purpose of our trip was to take pictures, frequently stopping wasn’t a problem, but it was threatening our chances of getting to the park at the right time. Eventually we decided to jump on the 1 train to expedite our journey. Once we got out of the subway we made a beeline towards the park. When we finally cleared the tall buildings of the financial district, I yelled out “boomshakalaka” in excitement once I saw the beautiful evening sky. For the next hour or so my friend and I were treated to one of the better sunsets I’ve seen in a while. We both shuffled around the park trying to find the best shot. I eventually spotted a patch of tall grass which provided me with a good foreground subject and sealed the deal for this week’s picture. Since this week is the first time shooting with my new Sigma lens it makes sense for me to talk about some of the advantages it provides. One of the advantages which benefited this week’s picture is the Sigma’s nice bokeh. As I talked about last week, bokeh is the part of the picture that’s out of focus. One thing I recently learned is that with nicer lenses the bokeh is smoother and although it’s a little bit of an oxymoron, the out of focus images are sharper. 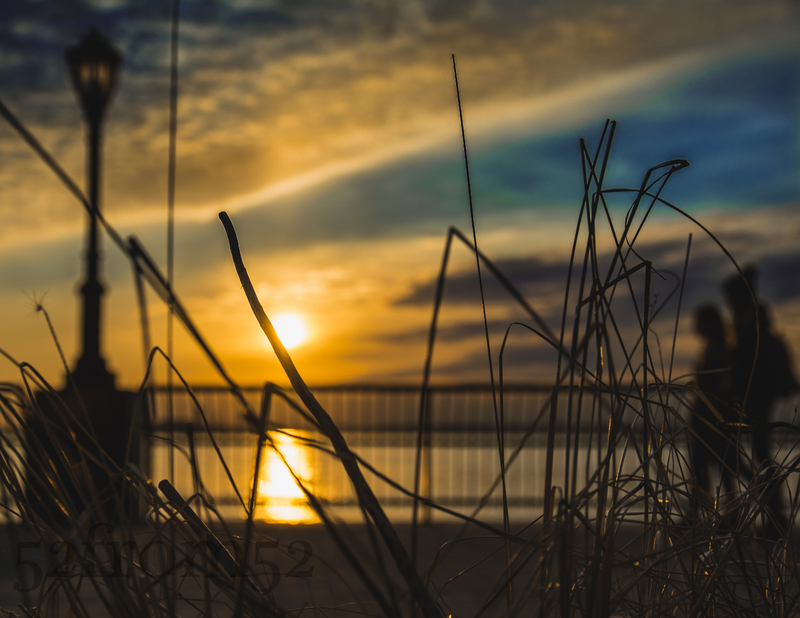 The nice bokeh worked well for creating silhouettes of the lamp post, railing and couple walking. Another advantage the Sigma has is a low fixed aperture of f/2.8. Although the Sigma doesn’t beat my Nikon 35mm’s f/1.8 aperture it’s still large enough to make shooting indoor and night pictures easier. The Nikon beats the Sigma aperture but the Sigma has a 4-stop Anti-Shake feature which allows for slower shutter speeds. This means that although the Nikon can let in more light via a wider aperture, the Sigma can let in more light via slower shutters (without using tripods). The term 4-stops means I can go 4 stops lower than the recommended shutter speed for a specific focal length. When shooting at 35mm (52 with a crop sensor) it’s recommended that I stay at or above 1/100 of a second. Thanks to the anti-shake feature I can hit a shutter speed of 1/40 of a second, and possibly slower if I have any added stabilization. This is a moot point if you’re using a tripod but it’s very relevant when you’re shooting indoors or at night. The last advantage I’ll quickly mention because it’s not one that can help me during my 52from52 photoblog series is that the Sigma is a zoom. The advantage of having a zoom lens is pretty obvious. With a zoom you’re able to recompose your picture without moving and hit targets that a 35mm prime can’t. Because it’s a zoom I might use my Sigma again in some upcoming posts, not to shoot my picture from another focal length, but so that I have some flexibility for the pictures not meant for this blog. The Sigma’s focal length range 17-50mm ( ~25-75mm) is very versatile. The lens moves from wide angle to a nice focal length for taking pictures of people, especially when I can maintain a f/2.8 aperture. The possibilities this lens has is exciting so stay tuned! Like many people my age, on a usual Saturday night there is a good chance you’ll find me out at a bar with friends. This past Saturday night however was not my usual evening. This weekend was different because I was providing 24/7 support for work. Working in IT has it’s perks but it also occasionally carries some unique responsibilities, one of those being support coverage. This weekend was the first time I held this role in a long time and it’s not one that I take lightly. While covering support I need to maintain my wits and have a quick response time if I get any calls, therefor going out to a bar isn’t on my social menu. Coincidentally this weekend the newest season of “House of Cards” released on Netflix so that provided the perfect means to pass my Saturday night. Though I had a good TV binge in the queue, I decided to pop outside for a little with my camera. Earlier in the week I took a picture which I planned to use as this week’s post. My goal for Saturday night’s picture hunt was to try my hand at recreating and or improving my previous picture. The original picture was shot on Washington street and was more of an accident than a planned image. When you’re attempting to take a picture in the middle of the street you can imagine how one might feel rushed. It could be the possibility of getting hit, or just the fact that people gaze upon you like you’re crazy. Regardless of the reason, while shooting my original picture from the middle of the street I felt rushed and thus fired off some quick pictures, a few of which were not in focus. After reviewing the unfocused batch of pictures, I actually liked the way the blurred imaged looked. Fast forward to Saturday night, my goal was to not leave this round of pictures to chance. My plan was to use the manual focus of my camera to create a “controlled” blurred image. My chosen spot was at the corner of 13th/Washington. As I stood at the corner waiting for the light to turn red, I fiddled with my focus to get a blurry but clear enough to see image. During one of my practice pictures I accidently got a taxi in frame which triggered the idea of creating an picture that represented how I usually recall Saturday nights. I waited a couple of light cycles until again having a taxi staged for the picture. Once the light turned red I darted out into the street and captured this week’s image. The more I learn about my camera, the more artistic freedom I have to create the images that are in my head. Although this week’s picture wasn’t an exact representation of what I mentally saw, it was close. This is the first time I used manual focus for a featured post and I’m happy with the result. Manual focus gives you the freedom to choose the exact focus you want rather than relying upon the camera to make the decision. It would have been nearly impossible to shoot this picture if I only relied on my camera for focusing. When in autofocus mode your camera needs to focus on something in order to shoot. There is a setting to override requiring focus but it’s easier to put your camera in manual. Putting your camera in manual focus allows you to take a picture no matter what the focus is, blurry or razor sharp. 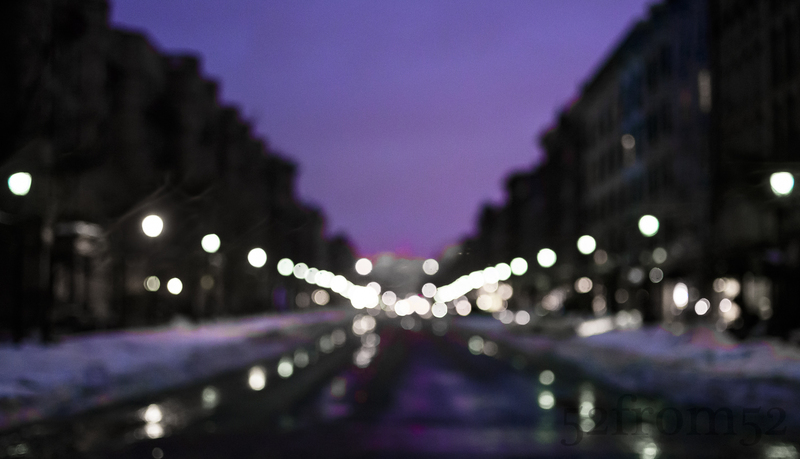 The reason I wanted to achieve an out of focus image was because of the effect it creates. The effect that results from images being out of focused is often referred to as “bokeh.” Most of the time bokeh is used to create separation in a picture between the subject and background. The intensity of the bokeh usually increases as your aperture gets larger. This technique is used a lot in portraits such as head shots. In my picture instead of focusing on one subject and blurring out everything else, I blurred out the entire image. I wanted to use the blurriness to create a sense of disorientation from looking at the picture. 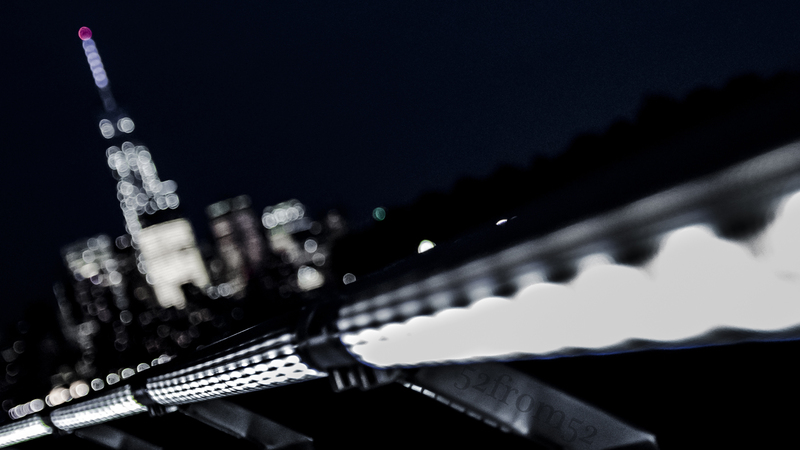 I also wanted to use the blurry lights to create the composition of my image in the form of leading lines. 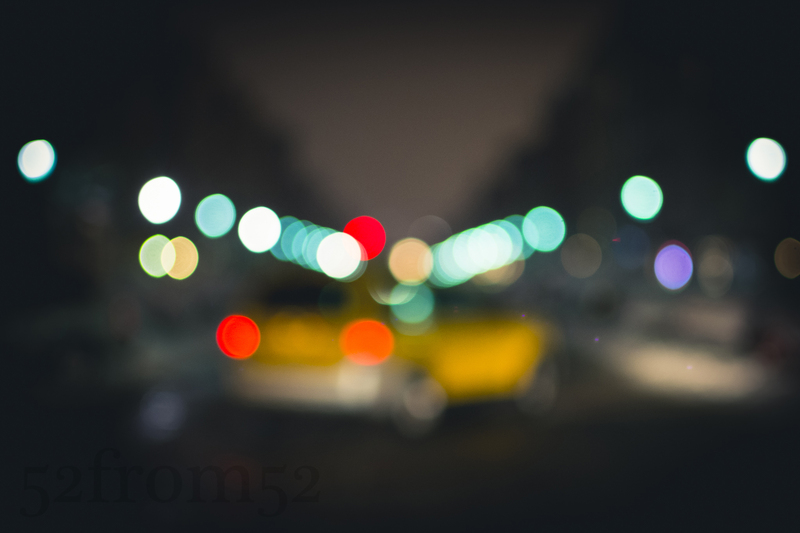 All of the lights are pinched inward to pull your focus onto the blurred out taxi. The leading line composition was meant to represent the usual progression of a saturday night, increased blurring over time and ending in a taxi. As you can see by applying some of the lessons that I’ve learned, I was able to create the image that I wanted. Of course some chance was involved this week, but the lesson to take away is that once you start to build your photography toolbox it’s important you know what concept to take out or apply to achieve the image you’re going for. Your creativity will always be limited to the speed that you’re able to think of your feet and apply your knowledge. This week I finally got the chance to make a return visit to Top of the Rock. My first visit was six months ago and was only two weeks after I purchased my Nikon. Since my last visit I’ve often looked back at the pictures I took and thought about the many things that I could have done better. I’ve learned many lessons over the past six months, in part because of this blog but also because I’ve immersed myself in photography. Articles, YouTube tutorials and experimenting with different techniques have been my main sources for learning. One other source of learning that might surprise you is instagram. I often flip through different hashtags looking for ideas of what to shoot or to see how people photograph certain subjects or places. Instagram has photographers of every level ranging from the professional to amateur, and or dare I say serial selfie taker. Before and after my trip I looked through the hashtag #topoftherock to see the kind of pictures people took during their visit. Besides the selfies and couple pictures I noticed that nearly all of the pictures looked identical with the exception of changes to the sky or filter the person used on the picture. After seeing how people have been over-sharing the same picture I knew that I had to find some way to differentiate mine from the rest. During my visit even though my goal was to take an original picture, I couldn’t help myself from taking the classic Top of the Rock picture. I found myself taking the same kind of picture over and over again partially to make sure I got a good one, but also because in person it’s just that hypnotizing of a view. After about an hour of scanning the horizon for a unique view I came to the conclusion that from my vantage point there really was none. It didn’t matter where I aligned the buildings, I had already seen that picture, or one very similar, shared countless times. At that moment I decided to take a step back from my coveted position to see what new perspectives I could find. Within a matter of seconds I was rewarded for my decision. After stepping back I saw that all the people taking pictures were casting silhouettes in front of the very same view I was just photographing. I spent the next couple of minutes wading in and out of the crowd to try and get the a picture that met my satisfaction. Eventually the 20 degree weather got the best of me and I decided to call it a night. On my way home while thinking about my night, I realized the valuable lesson that I just learned. It’s very easy to get drawn into taking the obvious picture. The only way my photography is going to continue to improve or “move forward” is if I regularly remind myself to take a “step back” and find a new perspective on what’s right in front of me. Although I used the previous section to talk about avoiding the obvious shot, it doesn’t mean the classic Top of the Rock pictures aren’t good ones. 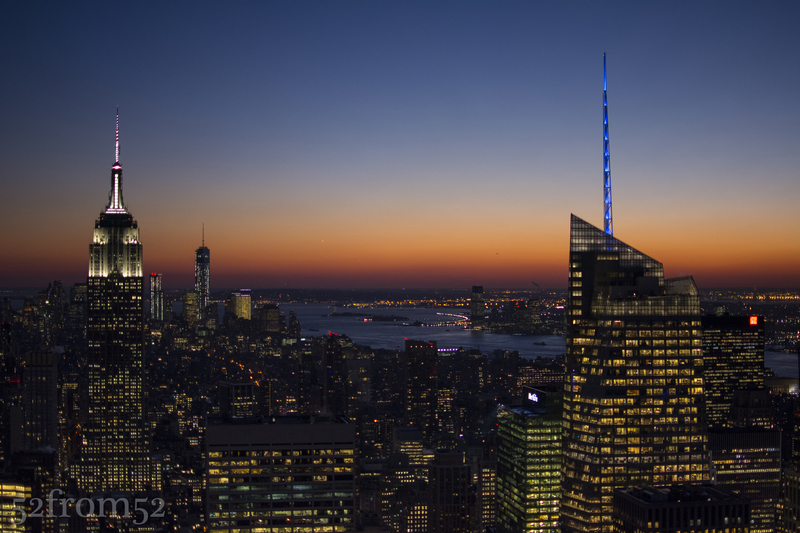 For the purpose of this blog I wanted to challenge myself to get something unique but it leaves the question, how do you take a good picture at Top of the Rock? As I mentioned earlier I often look back at the pictures I took during my first visit and dwell on what I could have done better. 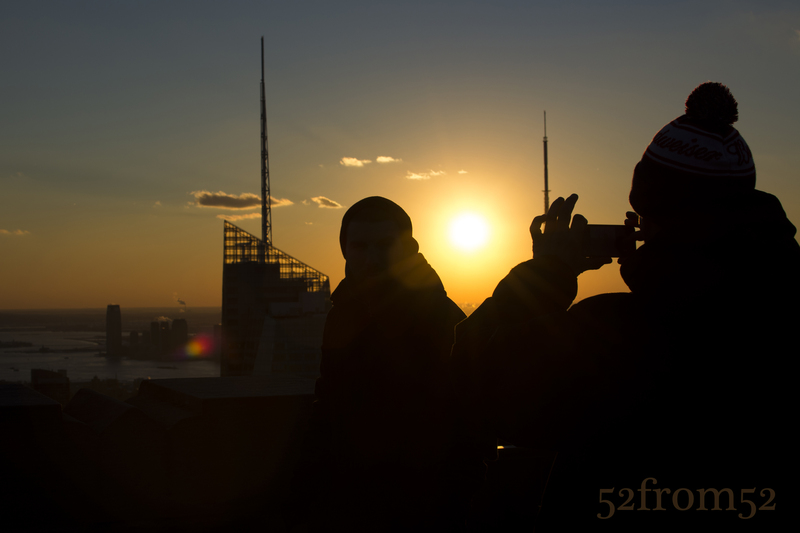 Let me share with you some of the lessons I learned between my two visits in terms of taking pictures at Top of the Rock. The first thing you have to ask yourself is what kind of picture are you looking to take? Do you want take pictures of only the buildings or are you planning on featuring yourself or friends in the picture with the buildings in the background? Knowing your subject is important to so you can determine the time you’re going to go and where you should set up shop once you’re there. Let’s start with talking about taking pictures of people. If you’re taking pictures that will feature yourself or your friends the location is less critical but the time that you arrive is important. In this case you’ll want to go about an hour before sunset this way you have time to take nice pictures in softer light and without flash. In my opinion flash is the worst when taking pictures at Top of the Rock. Unless you’re an absolute pro and know how to compensate correctly flash tends to wash out the city backdrop, which is one of the main reasons you’re at Top of the Rock right? In order to feature the cityscape behind you, don’t use flash, especially if you’re taking pictures on the 68-69th floor behind the glass. Once you find a nice location play around, take pictures of you subjects looking out towards the buildings or doing some forced perspectives (google it). If you want to get more original, take pictures of your subjects from a distance. Perhaps have your subject stand looking out towards the city and snap your picture focusing on them through the busy crowd? As was the theme of this blog, once you take a step back you’ll be surprised what new perspectives you’ll see. What about the settings to use or not use when taking pictures of people, other than flash? One option is to use the smallest aperture your camera will allow which will give you nice background blur and permit you to use a low ISO. The negatives of this is the exposure of your cityscape background might be overexposed. The solution, shoot your picture in such a way that you’ll be able to only edit the background later to correct the overexposure (don’t forget to shoot in RAW to enable this). Option two in terms of aperture would be to use a small aperture which if you took my advice and came close to sunset, is going to force you to use a high ISO. The negatives, you’ll have a grainer photo but the positive is you will have a more detailed cityscape background. If you’re only looking to share this picture on something like instagram a high ISO image is fine. Even with the wide aperture you still might have an issue with overexposure for the background so compose your picture accordingly. The last setting I mention is try to use a focal length of 50mm+, I won’t go into detail about why but if you want to know why check out the video below from one of my favorite YouTube sources. Now let me talk about what to do if you’re looking to take pictures of the buildings. First, I recommend going to the 70th floor and trying to lock down a position in the center area where you don’t have the bottom floors jutting into your picture. Getting this prime location is even more important if you’re using a wide angle lens. Just like shooting people, I think the best time to take pictures of buildings is right before and during sunset but you can go any time especially if there are nice mid-day clouds. For now I’ll talk about what to do at sunset. Going at sunset or at night really forces your hand in terms of camera settings. Unlike taking pictures of people, when you use a small aperture there aren’t many positives. 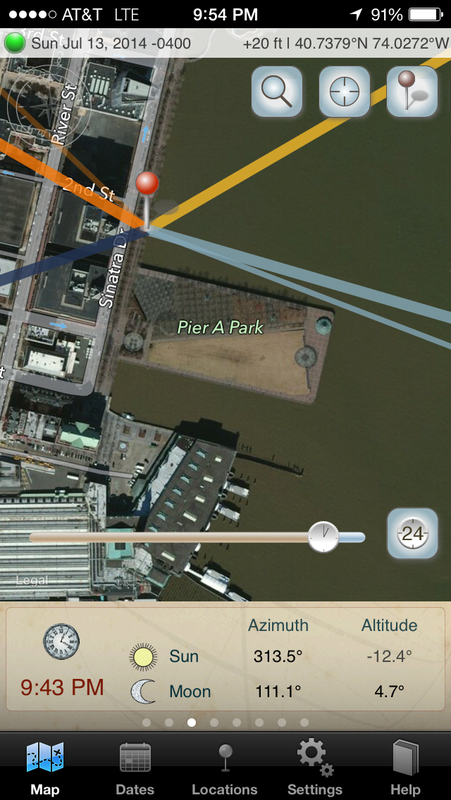 Your plane of focus is going to be narrow even with the buildings being far away. What’s going to happen is one building might appear in perfect focus while the others are a little blurry. You can still take a good picture using small apertures but if your goal is to get a crisp image that you can blow up on perhaps a canvas, I don’t recommend using small apertures. What are your options then? Option one, you can boost your ISO but this is going to still leave you with the problem of not having a crisp image for enlarging later. Option two, bring a tripod and shoot with a small aperture and slow shutter speed. This seems simple right? 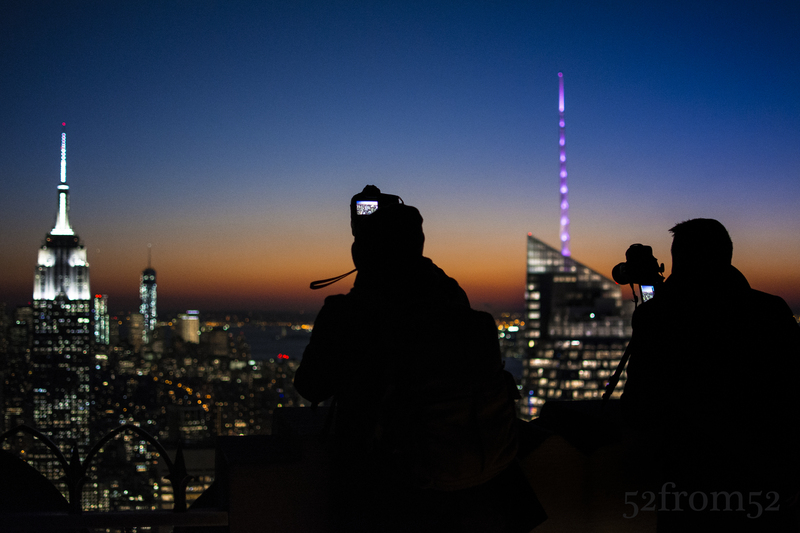 Well tripods are not allowed at Top of the Rock but there are ways around this rule. As you can see in this week’s featured picture people bring tripods. The key is to bring one small enough to fit in your bag, and one that has a small leg spread so it can sit on top of the cement pillars. This is also why getting a good location is critical, there are a limited number of cement pillars and or locations that can facilitate the use of a tripod. I’m not going to go into the all settings specific to tripods because if it’s pretty simple, small aperture, low ISO, slow shutter. Two things I will recommend though is use the multiple focus point setting which will grab more buildings in focus, and underexpose your image. One thing not to do, which believe it or not I saw someone do, don’t use flash while you’re shooting buildings on a tripod. Maybe I’m missing something and if I am please comment and correct me, but I don’t see any positive in using flash on a tripod when you’re not taking pictures of motion or people. These are some of the lessons/tips I’ve learned from my two trips to Top of the Rock. I still haven’t gotten what I would consider a great classic Top of the Rock picture, but that’s mainly because I haven’t brought a tripod or wide angle lens. I think I’ll take at least one more trip in a few months and try my hand using more than just my 35mm lens and perhaps a tripod. Until then I hope the lessons I’ve learned and shared so far help you shoot some great pictures at Top of the Rock, have fun and remember take a step back!